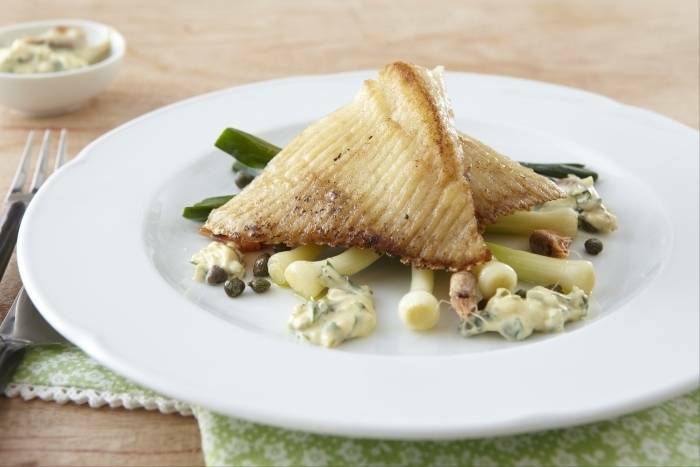 Skate wings roasted in olive oil and served with poached baby leeks and a brown shrimp tartare sauce. Preheat the oven to 180'C. Season the skate wings on both sides. Heat a frying pan to hot and add a splash of olive oil. Seal the skate wings on both sides and then transfer to the oven and roast for 10 to 12 minutes depending on size. Wash the leeks thoroughly and then poach in simmering water until tender. Drain and then toss the leeks in butter while still hot. Peel and finely dice the shallots and the garlic. Finely dice the gherkins. Pick the parsley leaves from the stalks and finely chop. Roughly chop the capers and the brown shrimp. Separate the eggs and place the yolks in a bowl. Add the white wine vinegar and the mustard and stir together. Start whisking vigorously and add the oil very slowly until the sauce begins to thicken. Once the sauce is thick, add the rest of the tartar sauce ingredients and season to taste. Place the roasted skate in the middle of each plate. Neatly garnish the edges with the baby leeks, small dots of the tartar sauce and chervil leaves. Serve immediately.